Cayuse 424 is a fast, easy-to-use Web application created specifically to simplify the creation, review, approval, and electronic submission of grant proposals that must go through Grants.gov. Cayuse 424 supports over 98% of the opportunities posted on Grants.gov, allowing direct submission for grants posted by NIH, AHRQ, CDC, NIFA, ONR, and others. Georgia Tech's Office of Sponsored Research offers training on Cayuse 424. Check our training calendar for details. Many federal agencies require applications to be submitted through Grants.gov. The Grants.gov system houses information on over 1,000 grant programs and vets grant applications for 26 federal grant-making agencies. 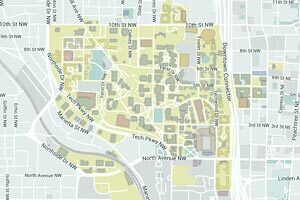 Georgia Tech uses Cayuse 424 to submit proposals through Grants.gov. NIH eRA Commons: The eRA Commons is the online tool system for managing NIH proposals and awards. Georgia Tech uses Cayuse 424 to send proposals through Grants.gov and into the eRA Commons. FastLane is the interactive real-time system that must be used to prepare, submit, and track NSF proposals. The principal investigator/departmental administrator prepares the proposal. The Office of Sponsored Programs reviews and submits the proposal. FastLane is also used for proposal review and award management. At this time, Georgia Tech does not use Grants.gov for NSF submissions. proposalCENTRAL is a web-based grant management service for proposal submission and review. The PI registers on the system, fills out a professional profile, and creates the proposal by entering the required information and uploading the necessary file(s). After the Office of Sponsored Research reviews a hard copy of the proposal and the proposal budget, the PI electronically submits the proposal application. GTCrossroads offers campus administrators, researchers, and PIs the ability to track proposals, manage awards, request subagreement actions, and submit sponsor deliverables. Congressional Directed Medical Research Programs: The principal investigator registers on the website and enters the required information. The PI also uploads the proposal files and indicates when the information and files are final and thus ready for the contract representative (namely, the authorized institutional official or a grants and contracts officer acting on the authorized official’s behalf) to review. A contracting officer or other official acting on behalf of the authorized institution must review and approve the proposal submission before the Department of Defense can accept or review the proposal. Grants: A grants and contracts officer must be the first person to register and create an application. The grants and contracts officer submits the application on behalf of the authorized institutional official. Please notify the contracting officer with the specific Application Package Title and CFDA number of the program to which you wish to apply. NAAR Grants Administration System: The principal investigator creates an account. Once the account is created, NAAR sends an email indicating that the PI may log in and submit a letter of intent. If NAAR invites the PI to submit a formal proposal, the PI enters the required information and uploads the necessary files. NAAR requires the responsible official (the authorized institutional official) to endorse the proposal and/or approve the budget online before the PI submits the proposal. NASA solicits research through the release of various research announcements in a wide range of science and technology disciplines. Researchers can help NASA achieve national research objectives by submitting research proposals and conducting awarded research. This site facilitates the search for NASA research opportunities. Space Telescope Grants Management System (STGMS): This site has instructions for downloading and installing the STGMS application. For submissions, have your departmental administrator contact the appropriate grants and contracts officer in the Office of Research. The principal investigator/departmental administrator prepares the proposal. OSP then reviews and submits the proposal. OSP must initiate accounts.